BC: Ruby & Rambo are Adopted! Ruby and Rambo, pictured above, are two handsome, energetic seven-year-old litter-mates who require new homes. 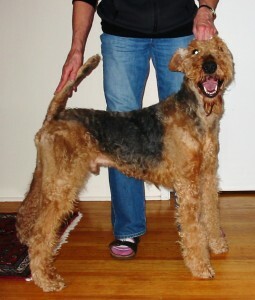 These are very well-bred, healthy Airedales. Both are good-natured, friendly, extremely affectionate and would make sensational pets. They are located in the Lower Mainland area of BC. Ruby and Rambo may be adopted as a pair or may be separated to go to individual homes. We would recommend a session or two of obedience training for both. Since these two have been raised with other dogs, we suspect that both would enjoy a canine companion but this is not an essential condition for adoption. We are unsure about their liking for cats and so would prefer not to adopt either out to a home already owning cats unless the cats are dog-savvy. 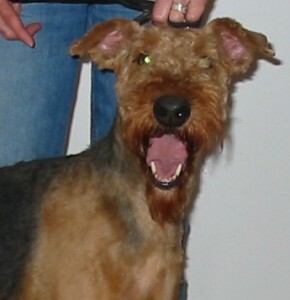 Because these dogs are energetic, they would suit an adult-only household or one with older children. Ruby and Rambo are really playful and will very much enjoy a home where they will receive lots of exercise and attention. Since these two have been raised using many holistic methods, we would favor a new household that would be willing to continue to treat them more or less holistically. To be considered to adopt either of these dogs, completing an application, which can be found on our home page, is required. Please specify somewhere on the application that you are interested in either Ruby or Rambo or both.